The Pathfinder Online MMO will put YOU in command of your very own kingdom in the treacherous River Kingdoms of the Pathfinder world. Get an early start on conquest with Pathfinder Online: Thornkeep, a complete gazetteer of one of the upcoming game’s starting towns and the deadly dungeons that sprawl beneath it! A co-production of video game developers Goblinworks and Paizo Publishing, this fully illustrated adventure sourcebook slots easily into any Pathfinder RPG campaign, and provides a tantalizing glimpse at the early production of the Pathfinder Online MMO, with behind-the-scenes accounts, sneak peeks at characters and environment images, and new details about the upcoming game. This 96-page book also includes complete original dungeon levels designed by a who’s-who of adventure design: Richard Baker, Jason Bulmahn, Ed Greenwood, James Jacobs, and Erik Mona! 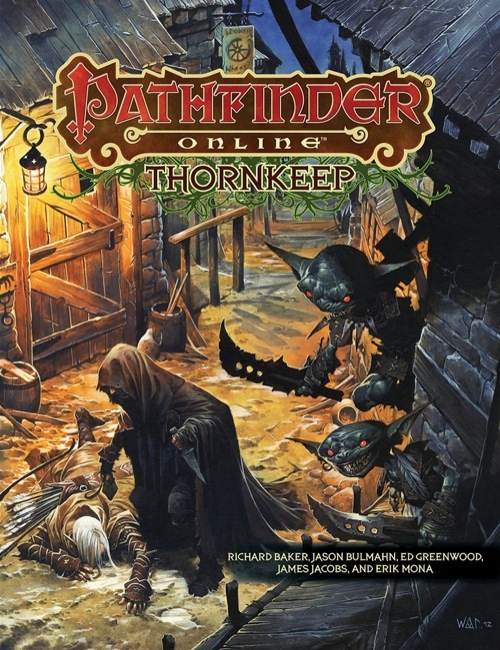 With enough gaming material to advance a character from 1st to 8th level, Thornkeep brings the action and excitement of the Pathfinder Online MMO to your tabletop! The Accursed Halls (by veteran RPG designer Richard Baker): Buried beneath the castle of Thornkeep lie strange passages and chambers that once belonged to a cruel Azlanti wizard of eons past. Goblins have begun excavating the so-called Accursed Halls in hopes of finding a lost goblin artifact, though their constant battles with the undead that haunt these corridors has left them blind to the dungeon’s other myriad wonders. The Forgotten Laboratory (by Pathfinder RPG Lead Designer Jason Bulmahn): The goblins of the dungeon's upper level took more than one trinket from the ancient laboratory that dwells beneath them. The wizard that created these items also performed dangerous experiments, many of which have gone out of control over the years. Stranger still, someone appears to be using the ancient equipment with sinister results. The Enigma Vaults (by Paizo Creative Director James Jacobs): In ages past, the mad wizard who dwelt in these halls collected many strange items in his travels—and the strangest of those he put on display here, in a museum-like complex he called the Enigma Vaults. When a group of thieves made their way into the vaults in hopes of a huge payday, they released something far beyond their capacity to control, and now they serve as the thralls of a sinister influence from a dark and distant world. Sanctum of a Lost Age (by Paizo Publisher Erik Mona): Scholars claim the dungeons below Thornkeep were built by the Ancient Azlanti, but how do they know, really? If Rozimus of Tymon speaks true, one level of Thornkeep’s dungeon holds survivors of that long-dead empire eager to return to the world and share the lore of their glorious age. They’re not undead, Rozimus claims, or illusory phantoms, but true living and breathing High Azlanti! But why does Rozimus know so much about them, and why is he so eager to return to the dungeon he claims almost killed him 5 years ago? Dark Menagerie (by RPG legend Ed Greenwood): In life, the wizard who ruled this realm kept many trophies, mementos, and even captured pets from his journeys, both to entertain his dark sensibilities and to cow his business associates and coerced allies. Now, kept alive all these years via stasis-inducing magic that's recently failed, the unfettered beasts of his magical menagerie run amok. Don't miss the Pathfinder Flip-Mat: Thornkeep Dungeons 2-Pack, which contains minis-scale battle maps of the four lower dungeon levels! 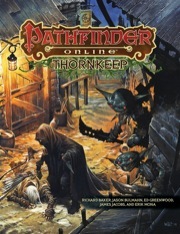 Thornkeep is sanctioned for use in Pathfinder Society Organized Play. Its Chronicle Sheet and additional rules for running this module are a free download (147 KB zip/PDF). Thornkeep is simply a large dungeon crawl. If you like that sort of thing where it is more combat and trap searching then you'll probably really enjoy this. If you want role play then best to avoid as there isn't much interaction down here. I rather enjoyed the whole experience apart from one character death (he was restored to the living thankfully). The problem with this adventure is that some of the encounters are far too powerful for the levels of adventurers delving those levels. Once again Paizo authors need to consider appropriate encounter levels and challenges. But even with that, I fully enjoyed playing this module. I've played all these scenarios as a player, and I own the paper for GM purposes. This is a perfect mini-campaign, just the sort of length I prefer and I wish they would make more of this size. I find full adventure paths to be on the long side, often taking more than a year to complete, and modules to be on the short side. Thornkeep is perfect. You can wade through these short, varied adventures and take a group through several levels in a month or two. The adventures themselves were interesting and difficult; combat-oriented for the most part. You'll never be forced to endure two-hour session of listening to the bard describe how he's romancing some noble woman before he rolls his D20 at last. I will say on the downside that the last scenario was weak. GMs should take license with a few of the details to make it play coherently. Also, the dungeons are cramped with larger groups (probably so they could fit it all on a flip-map). I had to declare a pet moratorium to fit people into rooms. Poorly designed. Makes me really think hard about buy anything written by the so called "Allstars of game industry" ever again . The play experience is bad, nothing but TPK . To many over powered CR monster for the level. The layout, art, and cartography in this product are excellent. The material on town of Thornkeep and environs is useful and well-done. Points of interest in the surrounding countryside, NPCs, town locations, etc. -- it's all here. There is even a full-page rumors table. Overall, things are very reminiscent of the better classic D&D products. Once we head into the dungeons below town, however, things begin to unravel quickly. The whole dungeon feels like a series of disjointed encounters strung together with little pretense of a coherent story. Admittedly, this is to be expected to a certain degree in a project of this nature, but much of the material simply defies logic. The last chapter is a behind-the-scenes of the upcoming Pathfinder MMO. I personally couldn't care less, and largely ignored this section, but if you're following the development of that the game, this chapter will likely be of great interest to you. Overall, Thornkeep provides an excellent base of operations, then squanders it on a disjointed, sub-par dungeon crawl. Only the sheer excellence of the first half of the book saves the product from a lower rating. This is all from a PFS perspective. YMMV. Accursed Halls: Good stuff. Deadly as hell, though. Forgotten Laboratory: Quite fun, given the right group of people. Enigma Vaults: Brutal, but interesting. Sanctum of a Lost Age: Fascinating, awesome, quality. Dark Menagerie: Ed Greenwood is kind of a big name, so it was a bit of a coup for Paizo to get him in on this Kickstarter event. Unfortunately, Mr. Greenwood's writing style seems to come down to this: He dropped his Bestiary on the ground and used whatever monster it opened to, repeated a few times, and called it a dungeon. The fact that it's a wizard's menagerie is the only thing that gives this a theme at all, and it's a tacked-on excuse to fight a bunch of different monsters with no storyline whatsoever. At one point there are four large creatures in a 4x10 room, which means they can move not at all. At another there are six creatures whose tactics are to use strength checks to knock over scenery but they all have strength scores of six. Even the box text is crap--I realized as I ran this the other day that he recycled lines, not just in style, but in the cut-and-paste sense. I was embarrassed on Mr. Greenwood's behalf. So, overall, good stuff. Four out of five stars for four out of five dungeons. PFS players, go for it! Just skip Dark Menagerie. Announced for January! The product image is a mockup; though it uses the finished cover art, details will likely change prior to publication. Note: This product is not part of any Paizo subscription. People who backed the Pathfinder Online Technology Demo at the $15 level or higher will get the PDF of this product in late October, and backers who pledged at least $50 will be shipped the print edition in January. PDF editions will be available for sale to the general public upon retail release in January. So the $24.99 price is for the PDF in January? Huh. I thought this would only be available to PFO Kickstarters. Any word on when the Kickstarters will be contacted for reward redemption by the way? Thought that the latest update indicated that the the fulfillment tool would ready in the next week or so. Is this print of pdf? Pagecount? I don't have a good grasp of how big this thing is. Huh. I thought this would only be available to PFO Kickstarters. Yes, I thought that was the case, as well. At least I had the impression it would be at first. However, I guess that has changed. IIRC, it's 96 pages. Might be bigger, I can't find it on the kickstarter page. The print edition, listed here, is $24.99. The PDF edition, not yet listed, will be $17.99. It is 96 pages; I'll make sure that's added to the listing in a moment. Oh, ok. So the Techo Demo contributors do get the flip-mats. I saw the product page for the flip-mats as well, and couldn’t remember if they were a stretch goal/additional reward. We were suspose to get the print editions in October but I guess that has changed as well. I have yet to see a gaming related kickstarter deliver exactly what they say and on time. I thought Paizo would be the first to change that. I guess 3 months late is not too bad. I guess those extra levels slowed things down. The kickstarter supporters still get a good deal. Just a little later than expected. The Flip-Mats are also available for preorder here. Yes, they were a stretch goal. The $15 tier gets you a PDF of the Thornkeep book. The $30 tier gets you a PDF of the Thornkeep flip-mats. The $50 tier gets you a hardcopy of the Thornkeep book. The $100 tier gets you hardcopies of the Thornkeep flip-mats. Reference for Thornkeep book info. That's ok. There were so many things added to the kickstarter it just slowed things down. 3 months is not a problem. Getting the pdf early is nice though. I was very upset when I realized I had missed being able to help with the Kickstart, and losing the chance to get Thornkeep as I have been collecting Paizo books since the start. I was afraid that I'd have a hole in my collection, so it is great to see we can buy this book now. Now just to eventually get a new powerful computer so I can run the MMoRPG lol. Given the insane amount of swag that got thrown onto the RA Kickstarter, I would have been amazed if there hadn't been some sort of hiccup. And it's still got to be one of the quickest turnaround times for an RPG Kickstarter. Just checked mine and it says it will be available in the near future. In the near future, backers who pledged at least $15 will be given access to the Thornkeep PDF, and backers who pledged at least $30 will also be given access to PDFs of the Thornkeep Dungeons Flip-Mats. The rest of the rewards, including the printed products, are on track to ship in January. I think it's a mix of this, GameSpace, and a general major upgrade of the site's code to better handle the current demands on the site (such as usage on portable devices). Major upgrades usually means bugs that need to be sorted out. It shows in my downloads but says it is not yet available. Is it possible to decide on upgrading to print edition after we've looked through the PDF? When I put it the code, it gave me the option to upgrade, not sure how long that option will last. Can't wait to hear what people think of the dungeon levels! Any ETA on when the link will go hot to access this in our downloads? It's my understanding that the PDFs will be unlocked as soon as the printing proofs have been approved by Paizo. So it really depends on the printer Paizo uses. Any news on the bookplates from the Kickstarter? Is not listed on my product purchases. I have to say that although being able to buy this book is nice, I am very Disappointed! I thought the point of the kickstart was to get something that would not have been available elsewhere. Had we been told that I could simply purchase this book in January I would not have wasted 50 bucks on the kickstart. No offense but I have ZERO interest in ANY mmo and only wanted the book. I have to say I for one feel cheated! They said from the beginning that extra copies would be made available to non-backers. I know I was fully aware of that fact when I pledged. I also am fully aware of all the other great stuff that came with my pledge in addition to the book. I never saw that info anywhere. I asked that question on the goblinworks page and got no answer. It's possible I missed it but it sure was not well publicized. I can appreciate that feeling, but it's not economically viable for Paizo to build a print run of a 96-page book of only 1600 copies and sell them at a price point most of us would feel to be reasonable. You might want to take a look at Wolfgang Baur's Open Design projects. Patrons get the materials as an exclusive for some time before they're open to the public. I actually am a big fan of Mr. Baur's projects and usually have to wait until they are open to the public for budget reasons. I also understand what you are saying with print costs ect.. however I paid for what was basically advertised as an exclusive,and I really had to wrangle my budget to keep my collection complete only to find out I didn't have to. It should have been very clear that this book would be available to everyone down the road and it wasn't. All the other perks are fairly meaningless to me as I have stated I have no interest in the MMO, what's done is done but in the future I will avoid any kickstart programs until I know what the whole story is. I am not trying to be difficult but I really do feel like I was misled, and the folks at both Paizo and Goblinworks need to know that. I pledged to get a signed copy, and to support goblinworks. Your pledge at the very least made the book better by adding more levels to the book. Also, there's no guarantee that you can get a copy of the book after the fact. at least, not a physical copy. And if the kickstarter wasn't funded there'd be no book (or flipmats) at all. The thing is, though, thanks in large to the pledges we made and the level of our pledges, the book became much more than it was originally supposed to be, as I understand it. Originally it was going to be a book a la the Pathfinder Campaign Setting line but thanks to us Kickstarters, it grew in size and content, giving us more Golarion-specific content in the form of more dungeon levels written by some of the best in the business. I don't see any notification on my download page. I do, however, see the printed copy in my sidecart. Is there anyone who will be getting the printed copy who can see a mention of the PDF on their "My Downloads" page? The PDF will be showing up as available for download within 10 days as indicated in the Goblinworks blog. An email will be sent to you automatically to let you know it is available for download. It's not the fact that the PDF isn't yet available that confuses me; it's the fact that I don't see any text on the "My Downloads" page saying that the PDFs have been added to the account, but are not yet available. My wife (who also signed up, but at a lower pledge level) does have that text on her page. I've received the initial Goblinworks email. That instructed me to go to a page to register an account (my kickstarter pledge used a different email address from the one associated with my Paizo account), but as I was already logged in to my Paizo account everything appeared to link up automatically. I entered the claim code from the email in the "My Pledge Drives" box, and this appeared to generate Paizo order #2287083. John, I gave your account a nudge: You should see the correct information on your account now. Thanks, Ross - everything looks fine! I seem to have a knack for exercising edge conditions. I suspect that clicking on the link in the notification email (sent to an address that wasn't the one used for my Paizo account) from a tab in a browser session that was already logged in to my Paizo account might have been responsible. The fact that I'm a subscriber to the flip-mat line (and so will qualify from that as well) adds another complication, too. But, as we have learned to expect, Paizo customer service sorted it all out. Thanks again! Overall, I think you make a fair point. However, I don't think the bolder is quite true. As I understood things, the kickstarter was the only way to guarantee a copy. They did say there'd be some left over for sale via paizo.com I got the impression it wasn't going to be a huge print run, though. I definitely knew what the deal was, but I'm not sure where I read it. Probably on the paizo message boards. I do not recall getting an email like the one JohnF describes, with a link to register using a claim code . . .
Wasn't there supposed to be a goblin icon or something added to the "...Subscriber" titles of PF Online Kickstarter supporters as well? Maybe that was just raised as a possibility. It's been months, and I could easily be misremembering. The goblin icon only shows up on the PathfinderOnline subforums, not across the whole of the Paizo site. Is there a possible problem when my Paizo account email address differs from my Kickstarter account email address? It is my understqnding that what you mention is one of the resons for sending you a code to your Kickstarter email. You use this code to "attach" your Kickstarter rewards to your paizo account. I have the text in my download section saying I have this item, but I never got an email with my code on it. I've looked through all of my emails from paizo, kickstarter, and the gobliinworks guys. BTW, I use the same email for paizo.com as I do for kickstarter.com. I'm fairly certain the code is only relevant for those of us who don't use the same email addy on both sites. PDFs of the book and flip mats. And a unique tag if I ever go into the goblinworks area. Even buying the dead tree copy (unsigned) flipmats and (too small) T-shirt, I'd peg that at roughly $75. So I consider my $100 for that + signatures and the tag (and argueably the PDFs) well spent. Heck it means that I contributed $25 to a game I won't play. That's less than I spent on sending toys to a child I met once.